tape warble and level fluctuations were present on the rough digital transfer. during some tunings and applause between songs). in a continuous way, with smooth transitions. Gong 1973-06-19, a gig at Roger Salengro's salle - Lille, France, chez les ch'tis. Contact was made with the seeder (Sous-Marin) who turned out to be the taper of this show. 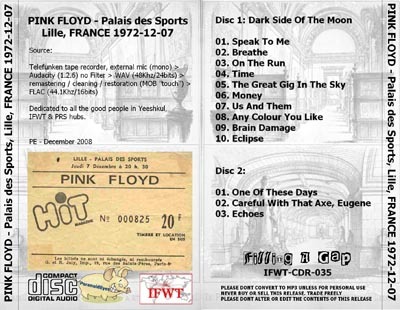 AM original broadcast (1970) : Pink Floyd 1970-01-23 at the Théâtre des Champs Elysées. I therefore encouraged him to torrent this recording. Then, on his website, I saw a date which intrigued me : Pink Floyd 1972-07-12,Lille. actually taped this gig and that SousMarin owns a mp3/128Kbits recording of this show. connected to an external microphone. I digitalized the tape with Audacity (version 1.2.6) using default settings. or apply any filters. This was a "rough" transfer direct from tape to HD. Dedicated to all the good people in Yeeshkul, IFWT & PRS hubs. Breathe - for his general help, and the use of IFWT label for this release. Raymond Dzarek (aka PhD.) - for discovering 2 years back that a recording exist! Philippe R., - for permission to use the ticket scan. ...and the last, but not the least, the taper ZEF (aka AndP. )!